The 2017 Audi Q5 is a compact-luxury SUV with two personalities. There's the standard Q5, with a powerful and efficient 4-cylinder turbocharged engine, or you can opt for a powerful V6. Those seeking even more performance can upgrade to the Audi SQ5, a performance model with more than 350 horsepower. 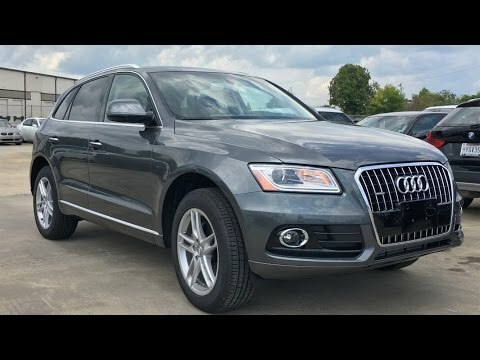 My Audi Q5 is a very safe to drive and reliable vehicle! I love, love, love my Audi Q5. When I got my first car, it was a VW Beetle; I loved that too - so much so that when it "died" after 12 years I bought another. Then, my brother became an Audi salesman. I was in heaven. I always liked the looks of Audis - and was pleased that Consumer Reports usually did too. I drove, and loved Audi A4s for my next 3 cars, but be because I am shorter than average was looking for a car where I would sit higher up to see better. Well, my last A4 was totalled by an inattentive driver and my wish came true. I got my dream vehicle, an Audi Q5, last December and couldn't be happier! No complaints at all! Educate your mechanics on car issues! The car is very loud inside. I continually hear a noise that sounds like something is grinding. Audi can not figure out the issues ii also complained that water sits in the gas tank well. I shared that they just need to pop out an area to let it drain. The first repairman said he didn't know what I was talking about do I want to someone else who knew how to quickly fix it for free. No more water issues. No problems at all. I really love it. Comfortable, quiet, and handsomely styled, the Audi Q5 provides the premium look and feel . The Q5 is stylish, relatively spacious, and has standard all-wheel drive. Those looking to turn their Q5 into an all-weather missile should consider the SQ5, which is the most powerful variant available. Volkswagen Group of America, Inc. (Volkswagen) is recalling certain 2017 Audi Q5 vehicles. Due to a manufacturing defect within the gearbox, despite selecting the Park position, the vehicle may still unexpectedly roll. Despite selecting 'Park', if the parking brake is not applied, the vehicle may rollaway, increasing the risk of a crash. Audi will notify owners, and dealers will replace the geabox in the affected vehicles, free of charge. The recall began May 15, 2017. Owners may contact Audi customer service at 1-800-253-2834. Volkswagen's number for this recall is 37K6.